Gustav Holst was thin and anaemic yet his movements were quick and he walked in long energetic strides. Looking for ways to remain thrifty, Holst would walk or cycle much of the way home to Cheltenham from the College. He must have looked like an odd figure with his trombone strapped over his back. 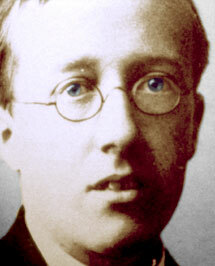 In 1895, Holst was surprised to learn that he had won an open scholarship for composition. The news was a relief, as he was then able to continue his studies at the RCM after money from home became scarce. He augmented his college grant of thirty pounds by playing trombone on the pier at Brighton and other resorts during the summer holidays. It was soon after accepting the scholarship to the Royal College of Music that Holst wrote his first opera. Under the guidance of his composition professor, Charles Stanford, Holst set to music a libretto written by Fritz Hart based on a card game episode in Beau Brummel. He called it The Revoke and gave it his Opus 1. Stanford was very enthusiastic about the piece and almost had it staged at the Opera Comique in Paris where one of his own operas was being performed, but The Revoke has never had a public performance. In the autumn of 1895 Gustav met Ralph Vaughan Williams for the first time. It was the beginning of a lifelong friendship. It was also the beginning of the their habit of playing their compositions to each other while they were still working on them. Sometimes they would walk along Chiswick Mall or by the river with other college friends while discussing the poetry of Walt Whitman or the socialist works of William Morris. Holst joined the Hammersmith Socialist Club and listened to Bernard Shaw's lectures. He conducted the Hammersmith Socialist Choir at William Morris' house in Hammersmith Mall. And he fell in love with his youngest soprano. Her name was Isobel Harrison. She was a pretty blue-eyed blonde who persuaded him to eat properly, shave his beard, and improve hid sense of dress. One of Gustav Holst's early student works dating from 1897 was the Winter Idyll. The influence of Wagner, Mendelsohn and Grieg is clearly discernible. By now he was playing trombone in theater orchestras and organ at several London churches. In the autumn of 1898, the Carl Rosa Opera Company offered him an appointment as first trombone and so he regretfully left the Royal College of Music. At Carl Rosa, Holst coached soloists in unfamiliar repertoire. By playing trombone in the orchestra, he came to know an orchestra from the inside; this is invaluable training for a composer. In his mind's ear, he always heard the orchestration of a work from the moment he began composing it. It was in 1895 that Holst first became interested in Hindu philosophy and Sanskrit literature. His immediate impulse was to set some hymns from the Rig Veda , the most important of the Hindu scriptures, to music. Finding the English translations he discovered were hopelessly stilted, Holst decided to learn Sanskrit so that he could translate the words to his own satisfaction. In doing so, he opened an entirely new world for himself. 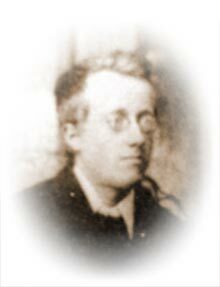 Holst began work in an opera, Sita , in 1899. It is based in the Hindu epic Ramayana . He worked on it, on and off, until 1906. Although it was never performed in his lifetime, he learned a great deal from it. His musical style was becoming more direct. In 1900, Holst wrote his Cotswold Symphony and in it was an elegy written in memory of William Morris. He also completed his Ave Maria, which was his first published piece. In 1903 he also wrote a symphonic poem titled Indra, which was a vivid portrait of the god, Indra, and his battle with the drought. Yet before he completed the evocative Indra, Gustav married Isobel in 1901. Their first home was in Shepherds Bush.